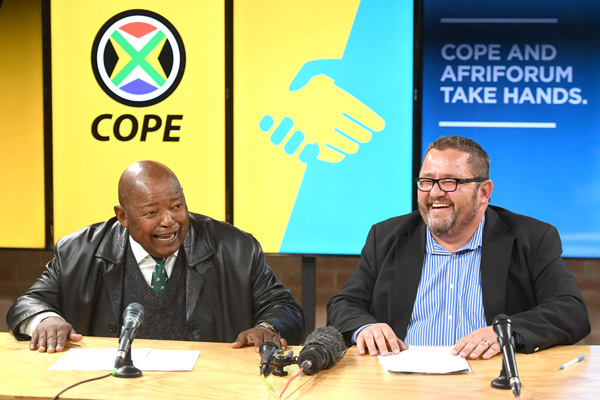 Cope leader Mosiuoa Lekota told the seminar Ramaphosa broke his oath of office by announcing land expropriation the day after he was sworn in. The plan to expropriate land without compensation showed the ANC “fooled” the white minority in 1994, AfriForum says. The ANC agreed to protect the languages, culture and property of whites in exchange for political power in 1994, AfriForum CEO Kallie Kriel said yesterday. He said to now amend the Constitution to expropriate land without compensation was “breaking” the agreement between the white minority and the ANC and was a violation of human rights. “Minorities agreed to hand over political power in return for protection of their languages, culture and property. “If this changes, it is a breach of the agreement and will lead to lack of trust between the minority and the ANC. “It means they fooled us in 1994 as they did not mean it when they made this agreement. Kriel was speaking at an urgently convened seminar hosted by business organisation Sakeliga in Pretoria yesterday. About 20 organisations that oppose the proposed amendment, including the Democratic Alliance, AfrikanerBond, Freedom Front Plus, Free Market Foundation and Congress of The People (Cope), were in attendance. Cope leader Mosiuoa Lekota criticised President Cyril Ramaphosa for “immediately” breaking his oath of office to uphold, obey and maintain the Constitution after he was sworn in as president. “He took an oath of office and the following day, he announced from parliament that he was going to take some people’s properties to give it to what he calls ‘our people’. Advocate Mark Oppenheimer of the Johannesburg Attorneys Association said South Africans would rather have permanent jobs or service delivery than land. He said that of the 1.8 million people who had been compensated through land restitution and the Land Claims Court, only 8% had opted to get their land back, while the rest wanted financial compensation. “Money is freedom and it allows one to start a business or buy land where they would like to own it. Government claims that there is hunger for land, but when you poll South Africans, their main worry is unemployment. “Thirty-three percent say they want service delivery, while only 1% want land.